Home › Economy › Is the Finnish government right in cutting sick leave pay? Is the Finnish government right in cutting sick leave pay? According to Prime Minister Juha Sipilä, the government has to find solutions to improve Finland’s competitiveness. A particular challenge is the 10 billion euro sustainability gap. The government has decided to cover 4 billion euros with savings, around four billion euros with structural reforms, and the remainder with measures to improve competitiveness, which include improving cost-competitiveness, pay moderation, and improving productivity. Following the termination of the social contract negotiations, the government, due to the very poor economic situation, has had to identify exceptional measures to reduce unit labor costs by five percent and enhance workers’ change security. One of the proposals is to reduce the benefit level for sick days so that in the future, the first day would be unpaid and 80 percent of the pay would be given for days 2–9. The global amount of sick days in Finland is more than 20 million days each year (Statistic Finland), which, according to the Confederation of Finnish Industries, is almost 25 percent higher (per capita) than in Sweden and Denmark. A report issued in March 2015 by the Ministry of Social Affairs and Health was considering that work left undone due to sickness absenteeism accounts for 3.4 billion euros per year, and that each day of sick leave costs on average 150 euros per person. As indicated to Finland Politics by Mikko Rissanen, senior officer at the Ministry of Social Affairs and Health, in the present system, the employer pays everything for sick leaves that are shorter than 11 days, and it represents generally 100 percent of the salary. That sum was approximately 1.9 billion euros in 2012. After that, the social security insurance Kela pays a daily allowance (less than 70 percent of the salary, decreasing with incomes), going either to the employer who is paying the daily allowance to the employee, or Kela pays the daily allowance directly to the employee in other cases. In total, Kela pays a total of approximately 673 million euros, coming from social contributions from employers (474 million euros) and from employees and individual entrepreneurs (199 million euros). What is expected first is that there should be a positive financial impact for employers so that one part of the approximately 2 billion euros that they now pay would no longer be paid to employees. The savings, evidently, will depend on the average duration of short sick leaves. The present sick leave system can be criticized, because it does not include incentives for employees not to take it. Employees are losing money only when sick leave lasts more than 10 days and the employer no longer pays the wages. If employees avoid sick leave, particularly on the first day of absence, which is not paid, the benefit for employers would be higher, because it could contribute to increased production, as the employer would not have to face unplanned absences. It can also be argued that people could go to work sick and possibly be contagious. It may hamper their productivity and disseminate the communicable diseases in the company or in public service, which is not positive for production. In 2011, the French government had decided that the first sick leave day would no longer be paid to civil servants, which was already the case for the private sector. A study published in 2013 has proven that the measure has had a serious impact on short-term sick leaves of hospital staff and the staff of local authorities: between 1 and 3 days (40 percent for 1 day and 12 to 18 percent for 2 to 3 days). There was practically no effect on the state staff. Local authorities have announced that they have saved 165 million euros in 2 years because of this measure. The measure was abandoned in 2014 after a change of government. The study has proven, in fact, that globally, there has been an increase of the sickness absence due to an increase of long-term sick leaves from 2011. The short-term sick leaves (7 days and less), which represented 49.3 percent of the sick leaves, were, in fact, representing only 8 percent of the sick leave days, while the longest sick leaves (more than 15 days) represented around 35 percent of the sick leaves, but 83 percent of sick leave days. Therefore, it was concluded that it is more efficient to work on these long-term sick leaves by prevention and treatment, as Sweden did 10 years ago, than to try to reduce short-term sick leaves. But, if I were to advise Prime Minister Sipilä, I would propose that he also look into the prevention of work disability, which leads today to paying 8 billion euros in disability pension, in addition to related healthcare costs. A strong effort to determine the direct and indirect costs of workplace accidents and an additional 2.5 billion euros a year would also bring some financial benefits and would allow a decrease in employers’ social contributions. Such an approach could be criticized because it takes time, but nevertheless, the measures discussed by the government cannot be implemented before the end of the present collective agreements in 2016. The impact will not be visible until 2017. 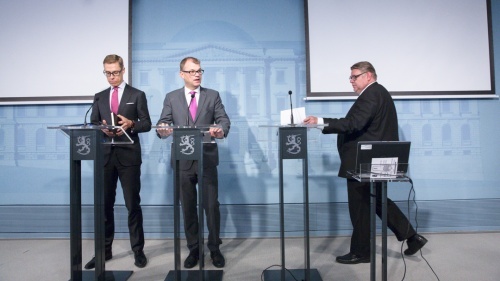 ‹ Refugees: will the Finnish government’s position be dictated by Juha Sipilä or by Timo Soini? Will it be aligned on Angela Merkel or on Viktor Orban?